Clearly one of the world's true wonders, one cannot help but be struck by the sheer grandeur of the moment. Though photographers may try, they are doomed to fail in efforts to capture the true immensity of the spectacle. This being said, even with more than a thousand words one would be frustrated when faced with the task of attempting to describe this wonder. Though I have driven by and even under this miracle of engineering for more than twenty years, I am still amazed each time I see it. It is no wonder that people come in droves paying good money and risking their lives to partake of that which this marvel imparts to the world. Those to whom has been given the task of representing this phenomenon and of acting as ambassadors seem almost jaded by the experience, sadly. Then again, perhaps this is the only way to survive in the realm of greatness. To truly understand might be to reduce one to disappointment with the rest of the world. Perhaps less than professional behavior is the only way they have found to cope. Perhaps a departure from good taste and even cleanliness would be the destiny of anyone who tried to touch the sky. Maybe the strain is just too great. 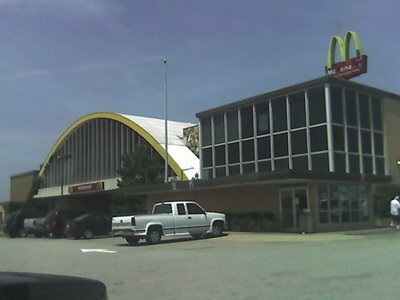 Whatever, the reason, I wouldn't bother stopping at the "World's Largest McDonalds" in Vinita, Oklahoma. Pictured from the eastbound side, Interstate 44 actually travels under this suspension structure. Guests on the day of our visit enthusiastically described the experience as "icky." Sitting here in Hampton Inn in OKC waiting for the family to wake up, I am remembering that I vowed never stay at a Hampton Inn ever again. You see, a few years ago at a Hampton Inn in Shreveport one of their cleaning staff stole my bride's wedding ring. So, starting now I will never again stay at a Hampton Inn. I won't forget this time. Anyway, it reminded me of some other folks who forgot to "never say never." "Never test the depth of a river with both feet." "Never stand between a dog and a hydrant." "Never raise your hand to your children. It leaves your midsection unprotected." "Never teach your children to be cunning. You'll be one of their first victims." "Never say 'oops' in an operating room." "Never try to pick up a woman who is wearing a Super Bowl ring." "Never interrupt an enemy while he's making a mistake." "Never ask what goes into a hotdog." "Never call a man a fool. Borrow from him." "Never be afraid of the deafeningly obvious. It is always news to somebody." "Never marry for money. You can borrow it a lot cheaper." "Never feel remorse for what you have thought about your wife. She has thought much worse about you." "Never tell a woman she does not look good in some article of clothing she has just purchased." "Never start a project until you have picked someone to blame." -Johnny Hart and Brent Parker. I have lost count of how many times I have heard of someone's amazement over the fact that more people voted for this year's American Idol than have ever voted in a presidential election. Ever. Honestly, I am not all that surprised. At this point we believe that American Idol is still pretty pure. That is not to say that we believe there is not a great deal of presentation going on and people on the show are not being manipulated in one way or another. But right now, we do believe that the contestants are basically pure in their motives and the judges are more or less honest about their opinions (if they are actually able to form one, Ms. Abdul) and regular people are deciding the fates of contestants through their votes. Well, that stands in stark contrast to what we think about politics. Both parties have been incredibly adept at convincing us of their lack of honesty. They have convinced us that we seldom actually vote based on talent or ability but rather on what they might deliver in exchange for our vote. We do not vote based on trust that they will form opinions and then act based on those opinions even if sometimes the expression of their honest stance may sting a little or even be a challenge to endure. No, I am not the least bit amazed that so many people voted for the American Idol. In their minds they were voting for something much more tangible than what is being brokered in smokey board rooms. 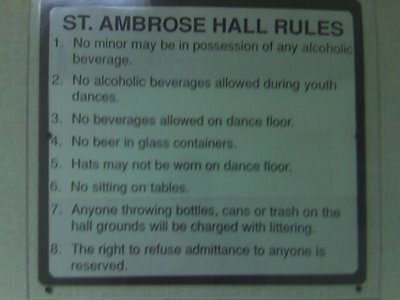 Although, some of the Idol wannabes will probably end up singing to bored people in smokey rooms. Funny how that works, Dog. Sorry for the extended absence. Of course, much of this is due to the fact that our family has been extremely busy. Part of it, though, is because I sometimes feel like I just don't have much worth saying. I am not about to presume that the mundane, day-to-day details of our life are of much interest to those outside our family. Then again, there are those in our extended family who seem to want to know about the kids so at times I throw some of that out there, too; like today. This is the last day of school. I sometimes wish I could feel that feeling again. It was awesome to walk away from that classroom feeling completely free and excited about the summer laying before me. I remember quickly shrugging off that hint of remorse that might suggest I would miss school or miss my teachers. The very idea! No, they would just have to try to make it without me. Sure, it would be tough at times, but they would get over me and get on with their lives eventually. They needed to be strong and eagerly anticipate the next year and the new group of students even if they would be a huge disappointment. That's how teachers feel, right? Well, my kids have the summer laying out before them, sort of. Connor is still playing baseball, though this year has been greatly disappointing. Our coach speaks in sound bites and while what he says sounds good, he does not keep his word. This is really tough to explain to a kid that is both logical and trusting. Connor has done well this year, but I regret that this lesson is one we have had to learn in this environment. On the other hand, we are not the only ones who have figured it out. This guy has alienated just about everyone and frankly, for reasons that are way less than noble. I have stayed calm, but I am ready get to the point where we no longer have to deal with this individual. One more game before the city tournament. I think we can survive that long. By the way, to see what Connor looked like when I picked him up from school yesterday, check here. Michal Kate has finished an awesome second grade year. Her teacher, Mrs. Moser, was perfect for her personality and Michal adored her. Now she is looking forward to a few camps and just having as much fun as she is able to find. I intend to help her in that endeavor in whatever way I can. Addie also had a teacher for which we were very thankful. Mrs. Brown was so sweet and nurturing, but she had a pretty strong-headed class and I am sure she is ready for a rest. If they ever rattled her, however, she never let it show. Even though our normal school campus was being remodeled this year and for one year everyone had to move into an old school, it seems like the kids and teachers adapted very well and had a successful year. Work is keeping me very busy. I am becoming more hands-on as far as the ranch is concerned. It certainly makes life more interesting, but it also has me away from the office more, which causes things there to pile up. Still, we're going to make it work. A weird thing happened this week to Kendra's new car. The back window spontaneously exploded. A teacher at her school happened to be standing several yards away when it happened. The big "BOOM" scared her to death (almost). Of course, it is not covered under the warranty (one more reason to be a little disappointed in Lithia Honda) and the $350 replacement cost is less than our $500 deductible. It is stuff like this that makes it easy for me to refuse lottery tickets. It does not rain luck where I am standing. Well, Kendra's mom has gotten re-married. We met her new husband the other day (after the fact). Honestly, he seems like a great guy. I am happy for her and frankly, for all of us. I look forward to getting to know him better in the years to come. He and his kids are quite financially successful and that's great, but I am already a little tired of hearing Kendra's mom compare us with them in ways we don't measure up. I hope this is just a phase that passes soon. We're going to Missouri soon for a heaping helping of the old South. I know Missouri isn't exactly the old South, but the experience will be. We are going for Memorial Day (or as it is also called there, Decoration Day). It is basically dinner on the grounds of the old cemetery where my grandpa, mom and sister are buried. And though it is something I remember from every Memorial Day growing up, my kids have never experienced it. This year we did not have a Saturday baseball game so I decided we should do it. It is a long trip for a weekend, but I'm kind of stupid that way. Perhaps we'll have some pictures up next week on the other blog. That's it for now. Thinking back, I suppose this post has been a bit snarky. I'll try to do better next time. "Hello. My name's Val and I am a worrier." "Hi Val!" responded a dozen or so voices. That is how I began some comments I made a month or two ago at church. I suppose this confession seemed like a convenient segue not unlike those delivered by the perky talking heads we see on the television news seemlessly weaving from one story to another. You know the types: "...and sadly there were no survivors in this tragic explosion. And speaking of survivors, let's go to Chip in the Weather Center and ask him how we're going to survive the weather this weekend? Chip?" But I digress. It was more than a convenient segue. It was true. It is true. I come by it naturally. My dad is a chronic and incureable worrier who remains convinced that we need to be stockpiling supplies and learning to speak Chinese. My grandmother, who also raised me after mom's death, has managed to go 99 years without any photographic evidence that she was ever able to turn that frown upside-down. And me? Well, I struggle with accepting blessings at face value. I am always suspicious that a blessing is a precursor to a curse or that a favor received is soon to be followed by a favor requested or that just when life is running smoothly, the other shoe is going to drop and the "dropping of the shoe" will be very similar to the "lowering of the boom." Occasionally, I do consider times in my past when, in fact, the other shoe did drop; when things were as bad as I predicted or even worse. And in retrospect, those were important times. They were times when the love of God was displayed by many and when the hope of Christ was even more important. I also consider how I have seen others react to adversity and how I have seen people use their hardships as a platform for helping others either by sharing their faith story cast in the light of their circumstances or by some other means. To me, that is the best possible way to respond to hard times. Not by waiting for one shoe or the other to drop, but rather by looking for ways to wash the feet those shoes may contain. I'll work on that. Sorry to post something of such limited appeal, (even more limited than usual, I should say) but I am wondering if any of you Abilene folks know of a builder or contractor in Abilene you would recommend for adding space to a house. Let me know if you are aware of such a person. 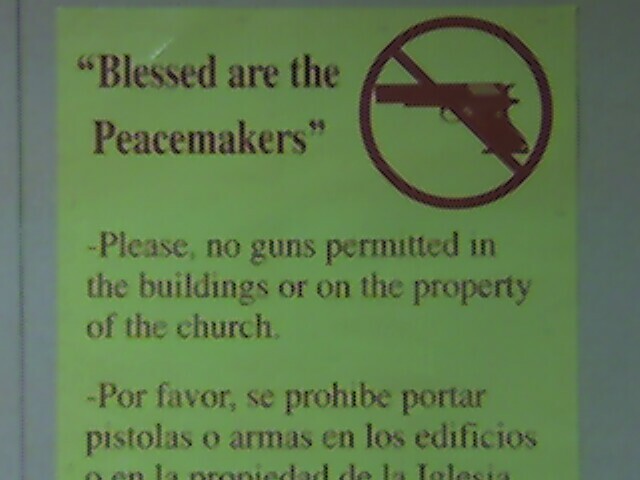 Give my interest in conflict resolution and the whole notion of being a peacemaker, I (and probably I alone) found this sign to be funny. It was posted next to the one below. It kinda reminds me of this. I saw these rules posted on the fellowship hall of a West Texas church building. Maybe I have always gone to boring churches, but this sounds a little wild. I wonder how many of the people weighing in on the immigration issue even know an illegal immigrant. I wonder how many know a legal immigrant. I wonder how many give a crap about the difference. I wonder how many lock their doors and why. I wonder how many people who wish to be a "missional Christian" have friendships with indigent people or people from other socioeconomic groups instead of treating them as projects. If we are really serious about the whole countercultural thing, does popularity matter? Perhaps it is especially telling. Sometimes I am a little amazed by how many environmentalists drive SUV's. I wonder why we are called to a different way of living but so many selectively apply the notion of difficult choices when it comes to politics and entitlements. Has "if it feels good- do it" ever worked? And yet, to expect personal responsibility it insensitive. Statistic suggest that that 800+ American family units will spend more than $1 million on flavored beverages this year. Results show that they will spend less than that over three years for their church building. I wonder how many other 36 year-old curmudgeons there are? I wonder why the brass ring fits so tightly as a collar and yet people keep reaching for it? I wonder why I'm so grouchy?